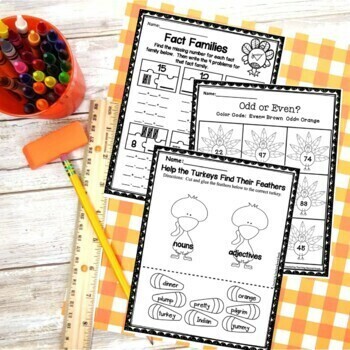 These worksheets are a fun way to incorporate math and literacy into your day. ►Which Turkey? ~ Directions: Color and cut out the turkeys below. Place in a baggie. Pull out a turkey for a total of 10 times. Tally as you go (put turkey back in the bag). Answer questions when finished. Answer by using the colors of the turkey. ►Can You Spell the Thanksgiving Words (2 versions for differentiation. 1 with word box, one without) ~ Directions: Cut out the letters below and spell the word for each picture. ►How many words can you make from Cornucopia? 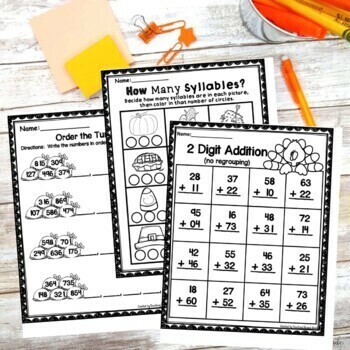 ►Thanksgiving Syllables (1,2, and 3) ~ Directions: Sort the words into correct trick or treat bag. ►How Many Syllables? ~ Decide how many syllables are in picture, then color in that number of circles. ►2 Pages of "What's the Value?" ~ Directions: Write the value for each underlined digit. ►2 Pages of Expanded Form ~ Directions: Write the expanded form for each number. ►4 Pages of "Help the Turkeys Find Their Feathers. 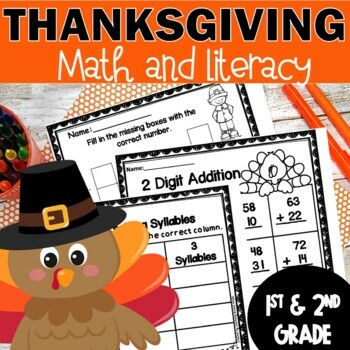 ►2 Pages of "Order the Turkeys" ~ Write the numbers in order from smallest to largest. ►Sailing Fact Families ~ Directions: Write the 4 problems to go with each fact family. ►Synonyms ~ Choose word that means the same. ►Run, Turkey, Run! ~ Directions: Help the turkey get through the woods. Start at the top. Follow and color the boxes with the words that are NOUNS. ►Hunt, Indian, Hunt! ~ Directions: Help the indian catch the turkey. Start at the top. Follow and color the boxes with the words that are VERBS. ►Writing: What are you thankful for? ~List 3 things that you are thankful for. ►Writing: What do you think of? Directions: List all of the words that you think of that describe “Thanksgiving”. Then write a paragraph using the chart. ►Write About It! Write a sentence to go with each picture below. 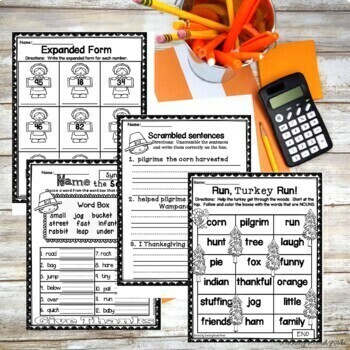 ►Thanksgiving Vocabulary Booklet ~ Write word 2 times each, then write it in a sentence. ►Scrambled Sentences ~ Directions: Unscramble the sentences and write them correctly on the line. ►Correct a Sentence ~ Directions: Make corrections to each sentence below. Then write correctly on the lines. ►MORE PAGES ARE INCLUDED IN THIS PACKET, BUT NOT LISTED ABOVE! Click the green star beside my name at the top of this page OR at the top of my store page. By doing this, you will see when I add a new products or have upcoming sales!